SAMSON Materials Handling, part of the AUMUND Group, specialises in the design and manufacture of mobile equipment for surface installation, providing flexible and cost-saving solutions, for a vast range of applications in bulk materials handling. The fundamental principle of surface installation and mobility is central to all SAMSON products. We focus on flexibility and economy combined with high engineering standards for long-term reliability. Combining the strength of an apron feeder with the cleanliness of a belt system, the Samson Material Feeder receives any kind of bulk material direct from tipping trucks or shovels, and provides a buffer holding capacity and controlled discharge to the subsequent handling equipment. With the mobile shiploader, high performance may be maintained without the need for fixed infrastructure. We provide dedicated designs for ship loading with many specialised features including mounted Samson Material Feeders, a complete range of trimming and powered manoeuvring systems, and effective pollution control. The Eco Hopper, a dust-controlled grab unloading hopper is an economical and ecologically sensitive solution fulfilling all needs for the efficient import of dry bulk cargoes. It is available in a wide range of sizes and specifications. The Stormajor® radial stacker / loader combines the benefits of the Samson Material Feeder with a radial outloading boom. Mounted on a wheeled or tracked chassis, the Stormajor® ensures stockpiling or barge / rail wagon loading as a fully integrated mobile unit. The concept of mobility is extended to mobile link conveyors operating in quarries with a mobile face crusher. This eliminates the need for fixed primary unit handling rates to 2,500t/h. Lengths of up to 70m are available. The SAMSON mobile concept for above-ground installation offers an economical alternative to conventional fixed installations in quarries, mines, production plants, ports and terminals, and any kind of mineral processing plants. Complete flexibility and fast-track availability allows SAMSON to react quickly to specific market situations with minimum investment risk. Changes to berth availability, multiple activities taking place at ports and variations in product supply and demand can create complications for all port operators. 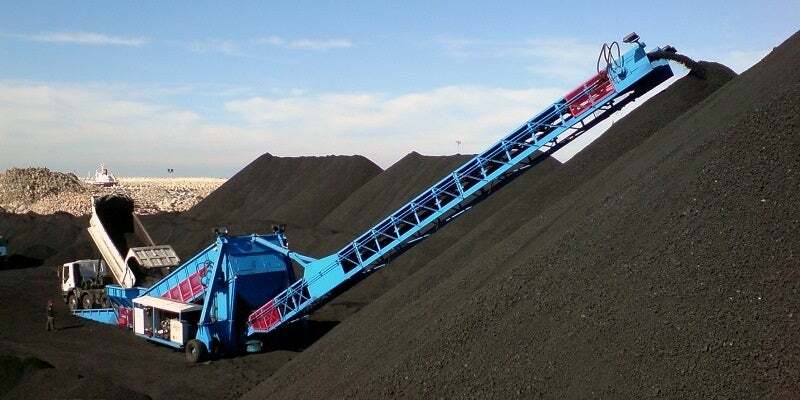 SAMSON Materials Handling developed the Samson™ surface feeder concept to satisfy the demands of clients requiring a mobile solution to receive general bulk materials such as coal and aggregates direct from tipping trucks in mainly ship loading applications where fixed plant was not a viable option. Kenya Port Authority celebrates reception of four cutting-edge ecological hoppers to improve their dry bulk import process and also mitigate environmental damage from fugitive dust. On 1 July 2017, a new company was incorporated under the umbrella of the AUMUND Group, and 49-year old Erwin Last became its managing director. SAMSON Materials Handling, under the umbrella of the worldwide operating AUMUND Group of companies, has received an order from Black & Veatch, a global leader in engineering, procurement and construction (EPC) services for energy and water, for two Samson® Material Feeders type 450 Super Series to operate as sludge cake reception units for Yorkshire Water, UK. SEA-Invest, one of the world’s largest terminal operators with expertise spanning a multitude of port related activities in 25 ports over two continents, have placed an order for an Eco Hopper from SAMSON Materials Handling, UK, destined for operation in the Ivory Coast. In June 2016, following an impressive 28 years of dedicated service and handling in the region of 700,000t of grain a SAMSON Stormajor®, a mobile stockpiling machine, was given a new lease of life by Forth Ports at the Port of Dundee. In cooperation with AUMUND France, SAMSON Materials Handling announces an order from Sorfert in Algeria for two identical Samson® Material Feeder units designed to receive bulk prilled urea from 30t tipping trucks. STAMA (Société de Transit d'Agence Maritime et d'Affrètement) has placed their second order for a Samson® Mobile 450 Super Series to be employed at the Port of Sousse, Tunisia.